Daube (rhymes with robe) is a classic French beef stew prepared with beef, red wine, vegetables and seasonings, all slowly braised for several hours. Every region in France has its own version of daube, sometimes cooked in a very deep covered pottery called a “daubiere”. It is cooked slowly for a couple of hours, until the flavours are melded. In New Orleans, Louisiana they make the daube a little differently. The influx of Italian immigrants in the late 19th century is the reason more tomatoes are used and many cooks put Parmesan cheese in the stew and serve it with spaghetti. Over the years I’ve tended to make it this way, and it garners many compliments. Cut the rump roast in half, and brown each half thoroughly on all sides in the olive oil or bacon fat in a large dutch oven. Remove and set aside. Fry onions and bell pepper well in the remaining oil in the dutch oven for a couple of minutes. Add garlic and fry 1 minute more. Put the browned meat in with the onions. Add tomatoes and beef broth. Add wine, cover and cook over low heat for two hours. Check once in awhile that there is enough liquid. Watch that the level doesn’t get too low, add water if necessary. Remove beef and slice against grain into half-inch slices. Put the slices back into the gravy and cook on low another 15 to 20 minutes. If you like beef, you will love this. Enjoy. This sounds great! I'm visiting from the A to Z challenge (melodygreen.wordpress.com) but linking my other blog to this instead since it is the recipe/food one! Omg, you just made salivate. Win. 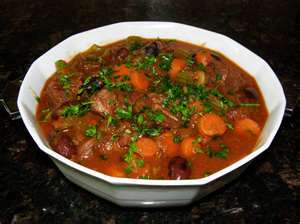 Your Daube sounds delicious! It's now in my recipe files, if that's alright with you. Check back with me again you may see something you like. I'm "A to Z blogging" recipes as well (although my blog isn't a food blog) Your stuff looks way more sophisticated than mine...but I look forward to seeing the rest of your posts through Z! Must be delicious, we must try to see how it goes. and now ... I'm hungry. I'm a new follower from the A-Z challenge. Nice to meet you! Delicioso! My tummy says I will be returning for more great recipes. Thanks! Good luck with the challenge! I love beef and can't wait to try this. I'm loving your posts! Thank all of you for your comments, I appreciate your interest and will be visiting you.